Noted journalist Shekhar Gupta on Thursday said that Congress president Sonia Gandhi and Prime Minister Narendra Modi were among the most interesting persons interviewed in his TV talk show ‘Walk the Talk’. However Gupta also regretted the silence maintained by former Prime Minister Dr. Manmohan Singh during his tenure as PM. Speaking at a special program organized by the Pune chapter of FICCI Flo, Gupta bared open his love for the cricket, food and shared his extensive experience in covering various events as reporter. Varsha Talera, chairperson of FICCI Flo Pune, Sabina Sanghavi, senior vice chairperson and Varsha Chordia, vice chairperson were present on the occasion. About Modi, Gupta said that it was unfair to portray him in black and white. “He is a very quick learner and hard worker man. He always learns a new thing which is why Modi is a new person every three months. Many global leaders are fascinated by him. When I interviewed him, he came as close as possible to say sorry for the Gujarat riots which was also a unique thing to my show,” he said. Among other personalities, he counted experiences of talking to Sachin Tendulkar and Mayawati. However, Gupta expressed his regret that former Prime Minister Dr. Manmohan Singh did not open up even after so many years. “Personally he is very articulate and honest. But I can't understand his silence,” he said. Gupta also rued the sorry state of TV news today saying that prime time news on TV has become theater and they have lost all the seriousness. “In the beginning, people liked this but now the audience is getting bored. Journalism has changed. The technology has lowered the entry barriers.” On the same note, he said that he was trying to build a new institution which will deliver opinionated news in new way. Varsha Talera outlined the Agenda for the year for Pune FLO. She elaborated on projects that FLO plans to do - to Empower women at senior, middle and junior level women in various fields. It was well attended by women from all walks of society. 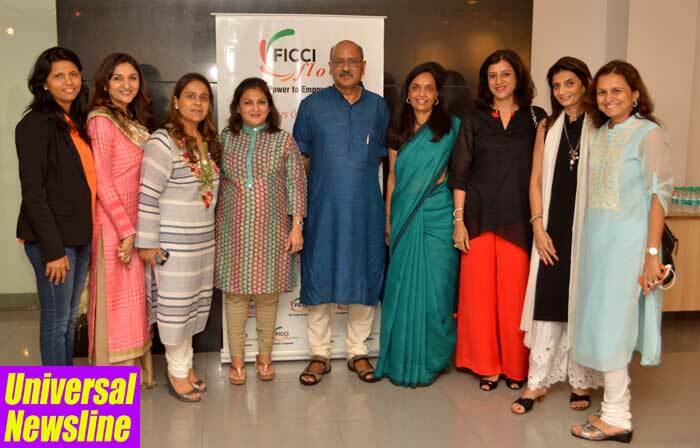 FICCI FLO is the largest Women's Organisation in South East Asia. There are 14 chapters all over India with more than 3800 members.